Along with Americans’ growing interest in yoga, yoga teacher training programs are churning out certified professionals. In the United States alone, there are more than 20,000 yoga teachers registered with Yoga Alliance and approximately 900 registered schools. Although not a replacement for exercise, yoga has become an alternate way to increase cardiovascular fitness and strength in the West. Teaching yoga may be a great complement to a dietitian’s offerings, as yoga emphasizes health and well-being. Learn how some of your colleagues are integrating yoga into their nutrition practice and consider the possibilities for yourself. Not all yoga teachers are registered with Yoga Alliance or trained by Yoga Alliance-registered schools. Because the industry does not have consistent standards, anyone can call himself or herself a yoga teacher. In addition, yoga is, in a sense, public domain, as it has existed for thousands of years. Yoga Alliance was organized to lead the yoga community, foster integrity, provide resources, and uphold the teachings of yoga as per its mission. The organization does not claim to represent yoga in the United States but does represent registrants and supports all yoga teachers whether or not they are registered with the organization. Yoga teacher training programs include techniques in teaching and practicing yoga; teaching methodology, anatomy, and physiology; and teaching yoga philosophy and ethics. Categories of yoga training include 200- and 500-hour levels, which reflect the intensity and time involved in the specific program. Reaching the E-200 or E-500 level indicates someone is an experienced yoga teacher who has taught for a specific amount of time and can also offer yoga continuing education programs. Some yoga teacher training programs offer the opportunity to develop specific projects and programs related to one’s area of interest. In addition, specialized yoga training programs are available in areas such as yoga for youths, chair yoga for older adults or those who are debilitated, and even yoga for eating disorder recovery and weight management. In addition, yoga therapy training is an offshoot of yoga teacher training. The International Association of Yoga Therapists (IAYT) defines a yoga therapist as a well-trained and experienced yoga teacher with substantial training in therapeutic applications and other supporting skills. Yoga therapy provides instruction in yogic practices and teachings to prevent or alleviate pain and suffering along with their root causes. The IAYT supports research and education in yoga and serves as a professional organization for yoga teachers and therapists worldwide. Its mission is to establish yoga as a recognized and respected therapy. Its membership is open to yoga practitioners, teachers, therapists, researchers, and healthcare practitioners who use yoga in their practice. The current IAYT membership is approximately 2,600. General yoga therapy programs are available along with specific yoga therapy programs such as for cancer or heart disease and even physical therapy programs. The cost of comprehensive yoga teacher training programs ranges from $1,500 to $4,000 or more. This is a small investment for long-term gains, according to some yoga teachers. In addition, yoga therapists are spearheading the move to develop billing codes through complementary and alternative medicine that could lead to possible insurance reimbursement. RDs who are also registered yoga teachers have incorporated yoga teachings into their nutrition work in a variety of ways. They are trained in different styles of yoga, including Hatha, Kripalu, Anusara, and Iyengar, along with YogaFit, a fitness- and wellness-based yoga training program. Some integrate it directly into their work while others keep it separate by teaching classes at local studios, health clubs, or gyms. Some conduct private yoga in clients’ homes. Robin Callahan, RD, MHS, RYT, was trained at Asheville Yoga Center in North Carolina and currently works at Cherokee Choices, a diabetes prevention program, as the nutrition and fitness coordinator. Classes are open to the community but targeted to those enrolled in the Native Lifestyle Balance Class: A Diabetes Prevention Class and the tribe’s work-site wellness program. Callahan teaches classes upon request for special groups such as the pain clinic at the hospital, the Cherokee Youth Center, and the Cherokee School system for staff and students. She also teaches at a local fitness center. Kat Brown, MS, RD, LDN, RYT, a clinical nutrition specialist at Children’s Hospital Boston where she also teaches Vinyasa and restorative classes for staff, adolescents, and parents, often integrates nutrition and yoga or meditation into the same appointment at her private practice. “I feel that my yoga training as well as training in motivational interviewing has helped me really listen to my patients and be more focused on meeting their needs rather than imposing an agenda. The integration of yoga and meditation into nutrition is an excellent complement because it hones the individual’s self-awareness, confidence, and body image. I find it especially helpful in working with patients with disordered eating,” Brown says. Cullum-Dugan also developed a Yoga for Mindful Eating series that combines the philosophy of yoga with behavioral change techniques, nutrition education, Ayurveda, and meditation and yoga poses. “When manager of the nutrition clinic, the other RDs preferred not to work with patients with eating disorders, so by default, I became the [eating disorders] RD there. I thought when I went into business on my own, I would not be in that market. Interestingly, Yoga for Mindful Eating attracts not only yoga students with body image issues but who also have eating disorders, weight issues, negative self-esteem, and binge eaters. It’s been an interesting journey, one that I’m excited to be on and continuously learning,” she says. Matthew Taylor, PT, PhD, RYT, is a physical therapist and registered yoga teacher who is a member of the IAYT’s board of directors and founder of the Dynamic Systems Rehabilitation Clinic in Scottsdale, Ariz. The clinic is a fusion of classical yoga therapeutic principles and his doctoral work in modern transformation learning theory. He also leads continuing education workshops for healthcare and yoga professionals and is widely published on integrative rehabilitation from a clinical perspective. Taylor has an interesting take on opportunities for RDs and any ancillary healthcare professionals trying to incorporate integral systems theory (eg, yoga) into their practice. “For so long, we’ve all been working from our silos of reductionistic perspective. 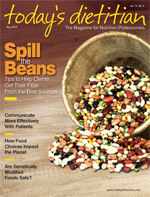 Dietitians have been all about the ‘fuel’ … 20% fat, organic vs. GMO [genetically modified organism], etc. The human was a machine and the question dietitians answered was what and how much fuel shall we have the machine take in to run properly—a very external, ‘other-than-self’ view of the integral interaction of humans with their food source. Get the right formula, consume the right amount … now you should be healthy. “Now early in the 21st century, we are coming to understand … that humans are much more than machines,” he continues. “The foodstuff we interface with is a source of celebration, discovery, community, and tangible expression of our relationship with the broader environment and peoples, whether grown sustainably, with pesticide residuals, etc. Our actions with our food alters and affects many webs of influence and does matter. But that’s the big picture. ... What about the dietitian at their desk down the hall in the hospital wanting to do more? “Yoga therapy provides the simple, practical tools for that practitioner that transforms their professional practice from a tear sheet of dos and don’ts into a life-changing relationship with their clients,” Taylor notes. “Yes, information about fuel is still exchanged, but more as an afterthought once education about the integral nature of our relationship with food is taught and after a practice of emerging awareness through asana, pranayama, and pratyahara is developed. The latter is taught from a new … perspective of the dietitian through these simple tools that helps transform the receptacle of the foodstuff by the simple physiology of the para/sympathetic responses of the GI [gastrointestinal] system to optimize the interplay of the human and food. Who else is nonpharmaceutically dealing with acid reflux, IBS [irritable bowel syndrome], etc in an integral manner by directly affecting acid production, gut motility, etc? Shouldn’t the dietitian be the professional [who] provides the science of optimizing the machine and counseling on the fuel? If not them, who would? You wouldn’t buy premium gasoline for an old clunker with clogged fuel lines, plugged carburetor, [and] tired spark plugs, would you? The opportunities are available to reinvent yourself at any moment. — Beverly Price, RD, MA, RYT, is principal of Jump Start Consulting, LLC, specializing in management and marketing strategies for RDs, along with seminars and distance learning products for continuing professional education and students.